Readers who have followed my work since the publication of my first book, Working On a Dream: The Progressive Political Vision of Bruce Springsteen (Continuum Books), in 2010 have likely noticed that my politics have shifted in various directions. The role of any thoughtful and thinking person must include closely observing new developments in history, politics, and sociology, obtaining new information and insights, and adapting accordingly. Citizenship requires the citizen to always move like a quarterback in a scramble – ducking and dodging oncoming opponents, reacting with agility and speed to changes in the play, and remaining steadfast in the commitment to advancing one’s priorities and purpose. In my new collection of essays, Against Traffic: Essays on Politics and Identity, I write about my own personal and political development, and how I escaped from the enclosed ideological cell of big government liberalism to find the free territory of individual freedom, neighborhood empowerment, and communal enlivenment. The new and exclusive title essay deals with the events that shaped my politics, and shows how I became a proponent of what Norman Mailer called “Left Conservatism.” I now take equally from the left and right, and I criticize both left and right – in the process claiming the inspiration of figures as diverse in range as Cornel West, Bob Dylan, Albert Camus, Gore Vidal, Stanley Hauerwas, Pope Benedict, and the aforementioned Norman Mailer. The new collection of essays demonstrates how a strong individual can move against traffic – creating one’s own identity and using one’s own intellect, heart, and spirit as cartographer. Most of Against Traffic is new material – the grand title essay and an introduction, but the book also includes my previously published letter challenging President Obama’s supporters, and my previously published essays on the death of American Empire, and the “dangerous alliance of big business and big government.” It closes with my eulogy celebrating the life and career of Gore Vidal. Against Traffic: Essays on Politics and Identity is a compelling and provocative collection essays from one of America’s most versatile and forceful young writers. David Masciotra, who writes about pop culture for PopMatters, literature for the Daily Beast, politics for Front Porch Republic, and religion for Relevant, turns his clear eyes, powerful intellect, and large imagination toward the fiasco of American politics. What follows is a blistering attack on the clichés of the left and right, and the superficiality, tribalism, and frivolity of the American political scene. In the title essay, Against Traffic, Masciotra takes readers through his deeply personal and political travels from the ideological trap of big government liberalism to the open ground of neighborhood empowerment, communal enlivenment, and what Norman Mailer called “Left Conservatism.” The essay also deals with the importance of literature, the arts, existential Christianity, and localism in the formulation of an edifying politics, citing figures as diverse as Albert Camus, Cornel West, Gore Vidal, and Pope Benedict. Masciotra shoots through the delusions of most pundits by indicting both big government and big business. President Obama, the liberals who have defended his disastrous policies, and the Republican Party are all undressed as equally culpable in the destruction of the American community and family. The political solution that Masciotra offers will surprise and please anyone concerned about the maximization of freedom and the empowerment of the everyday person. 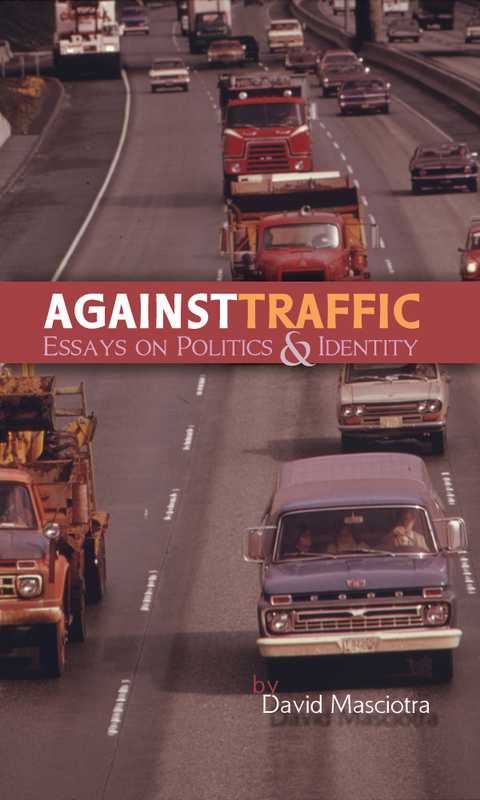 Against Traffic: Essays on Politics and Identity not only issues brilliant commentary on American politics, but also examines how independence, rebellion, and liberty are possible in an American culture committed to groupthink, party loyalty, and conformity. Against Traffic, which in addition to the grand title essay includes an open letter challenging President Obama’s supporters, an examination of the death of the American Empire, an exploration of the “dangerous alliance between big business and big government”, and a eulogy celebrating the life and career of Gore Vidal, is a must read book for Americans fighting to free themselves from the shackles of America’s dysfunctional, and often diabolical, political system and culture. It is a unique work of insight into how Americans can resist the restrictions of American politics, and live with strength, courage, and conviction. This entry was posted in Against Traffic, Books, David Masciotra, Politics and tagged Against Traffic, Books, David Masciotra, Gore Vidal, Norman Mailer, Politics by davidmasciotra. Bookmark the permalink.